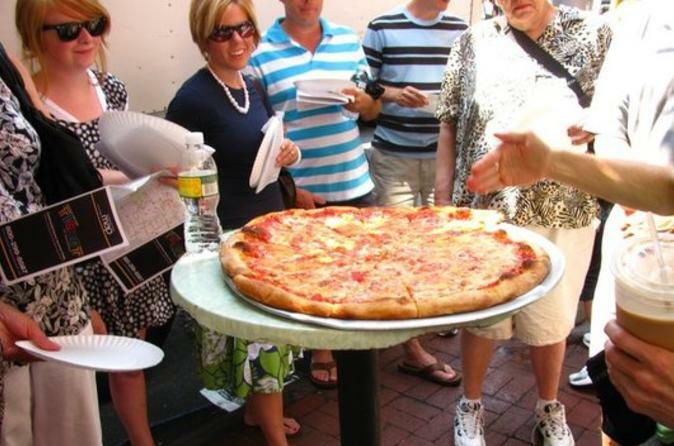 Experience New York's West Village like a local on this lunchtime walking tour that combines tastings of bagels, pizza and other neighborhood favorites with a hearty helping of history. See where famous writers and musicians including Jack Kerouac, Allen Ginsberg, Bob Dylan and Lou Reed hung out and where Monica on the hit show 'Friends' lived. Savor six tastings at popular West Village spots including Faicco's Italian Specialties, Hudson Bagels and Mamoun's Falafel. By the end of your tour, you'll have learned lots about the bohemian past and current hotspots of this beloved New York neighborhood. Your walking tour begins on Bleecker Street in the heart of New York's West Village. Long a favorite with artists of all types, this quaint, tree-lined neighborhood comprises the west side of New York's famous Greenwich Village and is home to some of the city's most charming streets and best food. Learn about eateries locals love from your knowledgeable guide, and bypass the lines. Stop into Faicco's Italian Specialties for a taste of homemade sopressata and Arancini. Sample New York-style pizza and authentic bagels that are boiled before baked. Enjoy cannolis from Pasticceria Bruno, a first-place winner on Food Network Challenge: Sugar Adventures, and visit Mamoun's Falafel, the oldest falafel restaurant in the city. You'll find your tastings at six different establishments (see Itinerary for a list) add up to an ample lunch. Your 3-hour West Village walking tour concludes on La Guardia Place — just a short walk from where it began — making it easy to spend the rest of your afternoon exploring the neighborhood and revisiting the restaurants on your tour for more tasty bites.